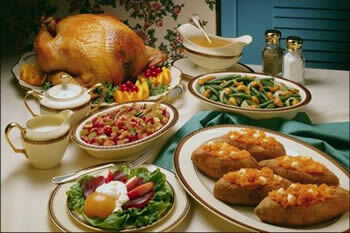 How to cook a Hassle-Free Thanksgiving Dinner! Please check out our easy to print Thanksgiving recipes for Chestnut Stuffing and Tangy Cranberry Apple Chutney. The perfect Thanksgiving side dishes! Wondering how to use that leftover turkey? Looking for a Homemade turkey soup recipe? Try our tasty Mulligatawny Soup recipe. I cooked my first full-fledged Thanksgiving dinner at the tender age of 48. I'd always had a parent's house to go to, or a friends house, or had gone to a restaurant/buffet for Thanksgiving with friends. I am now married and between my mother-in-law, my sister-in-law and myself we decided that I'd be responsible for Thanksgiving dinner. Luckily there are only eight of us. But cooking for them wasn't going to be exactly easy. I like cooking. I also like experimenting with recipes and trying new things. Luckily so does my husband. Not so much for the rest of his family. The first Thanksgiving meal I ate with them was at my mother-in-laws home. When I put the green bean casserole dish I had brought on the table my husband's nephew said "ugh, what's that?" Uh oh. They'd never had a green bean casserole before. Luckily he tried it and liked it. As I said, I like cooking and experimenting with new recipes, but I also like traditional dishes that I've grown up with. If I was going to make this Thanksgiving dinner a treat for everyone, and enjoyable for me to cook I'd have to do some planning. I'd have to cook a few things on the basic and plain side, the way the family is used to them, but I'd also have to have a few recipes to keep me happy. Quite a menu to undertake for the first Thanksgiving, wouldn't you say? Well, believe it or not it went off without a hitch. When I said we'd eat at 5:30-5:45 everything was ready by 5:45, and everything was hot and ready to go. The secret to this successful and hassle free Thanksgiving dinner was all in the TIMING. The first thing I did in order to keep everybody happy was to cook what everyone was used to eating and add a few things in to see how well they went over. The Sage Stuffing cooked in the turkey was something the family was used to. The Sage Sausage and Apple Stuffing was stuffing that my first boyfriends mother used to make and I loved it. I cooked it in a baking dish in the oven. The peas, green bean casserole and the creamed corn were what the family was used to eating. The Pearl Onions au Gratin and Candied Carrots were new. The fresh Cranberry Compote was a new recipe. Once dinner was over, family was gone and I had some quiet time II made notes about the dinner. I had too many peas, as well as too much creamed corn, cranberry jelly and rolls. Next year I won't make as much. The Sage Sausage and Apple Stuffing was a success. The Sage Stuffing was hardly touched. I wouldn't make it again except I like the fact that it help to keep the turkey moist, so it's a necessity, maybe not as much next time though. The carrots didn't go over well, so next year I'll make brussels sprouts (everybody likes them). The ham was delicious, so we'll have one again next year. The Madeira gravy was a huge hit, it stays. As for the turkey? It was delicious and WAY TOO BIG! I knew from everything I read it said 1 to 1 1/2 pounds of turkey per person and that this turkey was going to be WAY TOO BIG! My husband insisted on a 20 lb. turkey. Well, we didn't eat even half of the turkey. Next year I plan to cook a 15 pound turkey. I'll work my way down to a moderate sized turkey slowly as to not shock the family. I don't need to have all that leftover turkey. We haven't discussed the most important thing yet. Timing. I had a list of what time I needed to put everything into the oven. I made everything I could make the day before. I stored them in the downstairs refrigerator. Those things, the Pearl Onions au Gratin and the stuffing had to return to room temperature before they went into the oven. I even had the time I had to get them out of the refrigerator.